An Arizona Raft Adventures rafting trip makes the Grand Canyon Google Map as new feature, hiking the Bright Angel trail in Grand Canyon, street side view! If you have never checked out Google Maps, you should! There, you can explore the world from the comforts of your home. And now, Google Maps is in the process of doing “street views” of many famous landmarks around the world. You can virtually stroll to the edge of Niagara Falls, wander the colonnades of the Coliseum in Rome, walk under the stones of Stonehenge in Britain and now hike the Bright Angel Trail of Grand Canyon, with this interactive website. If you are planning on doing one of our upper or lower Classic Adventures, this feature may well be worth exploring to get an idea of where you will be hiking and what you may see. Go to https://maps.google.com/ , type in Bright Angel Trail Grand Canyon and then move your mouse or the arrows at upper left corner of map to discern where the trail is. Click to satellite view in the upper right hand corner of screen. Use the + and – symbols on the left side to zoom in or out to see different trail sections or the whole region. To see street view, drag the little yellow man on the upper left hand side of the screen to the trail. He will jump to the nearest panoramic view point when the green smudge below him turns to a push-pin, which are taken every so many feet on the trail. If you have never used Google Maps this interactive process will take some practice. You can also follow the arrows on the trail with your cursor to hike up or down from that point. Additionally, you will have the ability to stroll through the trees at Phantom Ranch, look at the views from various points on the trail, or peer over the edge. 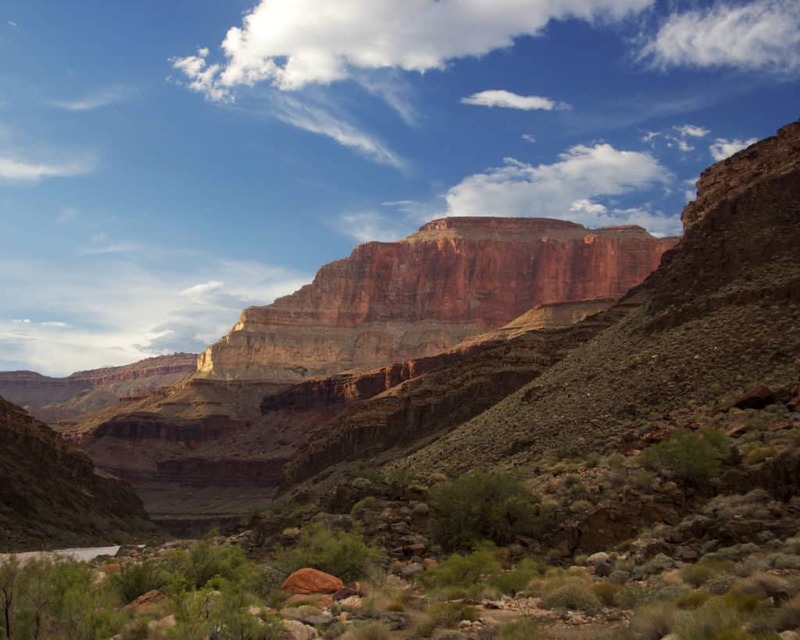 Can you find where the Bright Angel trail ends at the Colorado River? That is where our rafts do the interchange of guests at Pipe Springs beach. If you can find that point, you will see an AzRA trip in the process of meeting guests hiking in. Maybe you are one of the folks on the beach or hiking on the trail? Go exploring and check it out!